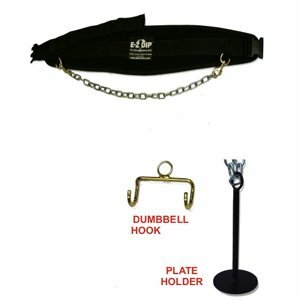 Patented never drop "E-Z load" Dumbbell Hook and Plate Holder. Dual "E-Z Adjust" chain snap hooks for optimal, no swing load positioning. Multi-user waist buckle snug with a tug of the strap for zero belt slip under load. Strategically placed 6mm neoprene hip cushions eliminate bruising regardless of load weight. If you have any questions about this product by E-Z Dip Belt, contact us by completing and submitting the form below. If you are looking for a specif part number, please include it with your message.